Thank you for visiting www.Onlinefireworks.com. We are proud to offer one of the largest varieties of Novelty smoke, Smoke balls, Smoke tubes, Smoke cones and Smoke Crackers on the market today in the United States. 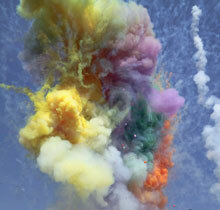 We also carry a full line of Pull String and fuse lit Smoke grenades for all your air-soft and paintball battles. We also carry the largest variety of cool burning smoke, please note some items are considered Haz-Mat and require special shipping as outlined in our shipping policy. If you have any questions, please feel free to contact us at customer support via email or phone. Our smoke lasts from a few fun seconds to over 75,000 cubic feet and 5 minutes. We carry many different colors, shapes and sizes to meet just about everyone’s smoke needs. If it smokes we most likely carry it, if we do not, email us at customer support and we will be happy to research it to better serve you in the future.